TLRs are central receptors of the innate immune system that drive host inflammation and adaptive immune responses in response to invading microbes. Among human TLRs, TLR10 is the only family member without a defined agonist or function. Phylogenetic analysis reveals that TLR10 is most related to TLR1 and TLR6, both of which mediate immune responses to a variety of microbial and fungal components in cooperation with TLR2. 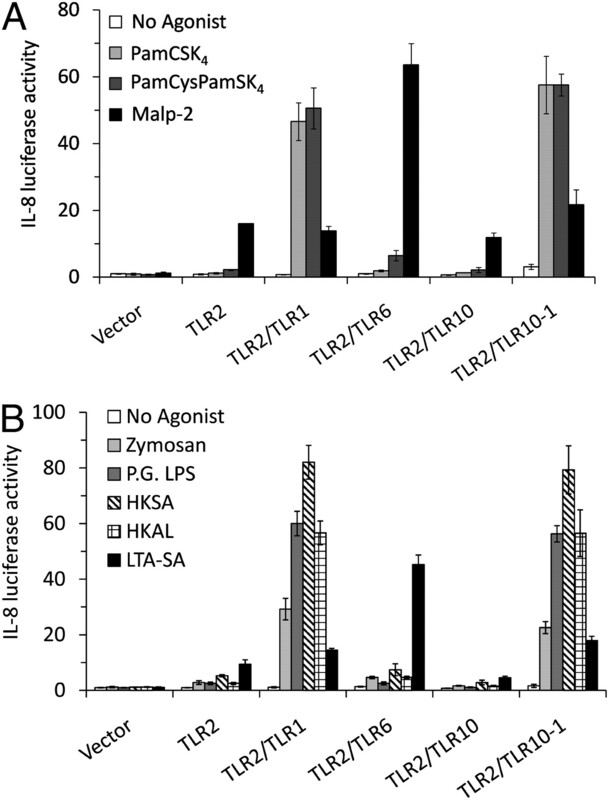 The generation and analysis of chimeric receptors containing the extracellular recognition domain of TLR10 and the intracellular signaling domain of TLR1, revealed that TLR10 senses triacylated lipopeptides and a wide variety of other microbial-derived agonists shared by TLR1, but not TLR6. TLR10 requires TLR2 for innate immune recognition, and these receptors colocalize in the phagosome and physically interact in an agonist-dependent fashion. Computational modeling and mutational analysis of TLR10 showed preservation of the essential TLR2 dimer interface and lipopeptide-binding channel found in TLR1. Coimmunoprecipitation experiments indicate that, similar to TLR2/1, TLR2/10 complexes recruit the proximal adaptor MyD88 to the activated receptor complex. However, TLR10, alone or in cooperation with TLR2, fails to activate typical TLR-induced signaling, including NF-κB–, IL-8–, or IFN-β–driven reporters. We conclude that human TLR10 cooperates with TLR2 in the sensing of microbes and fungi but possesses a signaling function distinct from that of other TLR2 subfamily members. The innate immune system is the first line of defense in response to an invading pathogen. Cellular innate immune defenses are necessary for the direct killing of pathogens, and they also mediate the immediate release of proinflammatory mediators that enable immune cells to access the site of infection, as well as the responses of professional APCs essential for generating effective adaptive immunity (1, 2). Primary triggers of inflammatory and adaptive responses are the TLRs, a family of cell surface innate immune sensors that exist in organisms ranging from lower invertebrates to higher mammals. Mammalian TLRs alert the host to the presence of infection through direct recognition of conserved structural components of viruses, bacteria, fungi, and protozoans (3, 4). In addition to microbial and viral products, TLRs sense molecules associated with damage to self-tissues as well as host products of inflammation (5). Humans possess 10 TLR family members (1–10), subsets of which are expressed in leukocytes and the epithelial cells of mucosal surfaces (6–8). In accordance with their role in host defense, monocytes/macrophages express most TLRs (6), whereas the expression of individual TLRs in dendritic cells depends upon their subtype (9, 10). The microbial agonists for TLRs include a wide variety of structures. For example, TLRs 3, 7, 8, and 9 collectively respond to nucleic acids from bacteria and viruses, and these intracellular family members induce the expression of type-1 IFNs that possess potent antiviral activities (11, 12). In contrast, TLRs 1, 2, 4, 5, and 6 sense outer membrane components of bacteria, fungi, and protozoan organisms, and these receptors are expressed on the surface of mammalian cells. Although most TLRs signal as homodimers, TLR2 requires TLR1 or TLR6 for activity (13). TLR1/2 and TLR6/2 heterodimers discriminate among different microbial products that include bacterial lipoproteins, bacterial lipoteichoic acids, nonenteric bacterial LPSs, fungal phospholipomannans, protozoan GPI anchors, and mycobacterial lipomannans and phosphatidylinositols (3). The cell surface TLRs engage a core signaling pathway, leading to the activation of NF-κB, AP-1, and other transcription factors that drive the production of proinflammatory chemokines, cytokines, and cell-adhesion molecules (14). Despite extensive research on the TLRs, human TLR10 has remained an orphan receptor without a known agonist or function. TLR10 was initially cloned in 2001 and shares the greatest homology with TLR1 and TLR6 (15). In mammals, TLR 10, 1, and 6 genes are tandemly arranged and seem to have arisen from duplication events. Phylogeny supports the idea that TLR10 arose before the gene duplication that generated TLR1 and TLR6 (16, 17). Chickens possess two TLRs that share ancestral origins with the TLR1-6-10 cluster and two additional TLRs that share origins with TLR2 (18). The fact that these chicken TLRs mediate responses to lipopeptides through cooperative interactions indicates that this recognition function predates the mammalian expansion of the TLR1-6-10 cluster (19). The TLR2 subfamily is thought to have evolved under positive and balancing selection and, among primates, Toll/IL-1R (TIR) domains seem to have undergone purifying selection (20, 21). The independent maintenance of TLR10 and its associated TIR domain suggest a distinct biological role for this receptor (16, 19). TLR10 is an unusual family member in that it is highly expressed in the B cell lineage, suggesting that it plays a critical role in B cell function. The presence of sequence gaps and retroviral insertions reveals that mouse TLR10 is a pseudogene, a situation that precludes the generation and phenotypic assessment of a TLR10 knock-out mouse. In this article, we report that human TLR10 shares a variety of agonists with TLR1, including a number of cell-surface components of bacteria and fungi. Similar to TLR1 and TLR6, TLR10 requires TLR2 for recognition. However, we found that TLR10 lacks the downstream signaling typically associated with other TLR2 family members. Veterinary care was provided by the clinical and technical staff of the Division of Animal Resources at the University of Illinois at Urbana Champaign, which is an American Association for the Accreditation of Laboratory Animal Care-accredited facility. All animal experiments were approved by the University of Illinois Institutional Animal Care and Use Committee. Synthetic bacterial lipopeptides, N-palmitoyl-S-[2,3-bis(palmitoyloxy)-propyl]-(R)-cysteinyl-(lysyl)3-lysine (Pam3CSK4), S-[2,3-bis(hydroxy)-propyl]-(R)-cysteinyl-(lysyl)3-lysine (PamCSK4), N-palmitoly-S-[2-hydroxy-3-(palmitoyloxy)propyl]-(R)-cysteinyl-(lysyl)3-lysine (PamCysPamSK4), and S-[2,3-bis(palmitoyloxy)-propyl]-(R)-cysteinyl-GNNDESNISFKEK (macrophage-activating lipopeptide-2 [MALP-2]) were purchased from EMC Microcollections (Tuebingen, Germany). The microbial-derived agonists, LPS derived from Porphyromonas gingivalis, heat-killed Acholeplasma laidlawii, lipoteichoic acid from Staphylococcus aureus, and lipomannan from Mycobacteria smegmatis, were purchased from Invivogen (San Diego, CA). Zymosan particles and heat-killed S. aureus were purchased from Invitrogen Life Technologies (Carlsbad, CA). Mycobacteria membrane fractions were received from National Institute of Allergy and Infectious Diseases Contract N01 AI-75320 entitled “Tuberculosis Research Materials and Vaccine Testing.” The Escherichia coli type II heat-labile enterotoxin LT-IIa B subunits were from Dr. T. Connell (University at Buffalo, State University of New York, Buffalo, NY). The monoclonal anti-FLAG Ab, HRP-conjugated anti-Flag (M2) mAb, and anti-hemagglutinin (HA) affinity gel were purchased from Sigma-Aldrich (St. Louis, MO). HRP-conjugated anti-HA Ab was purchased from Miltenyi Biotec (Auburn, CA). The anti-human TLR1 Ab (clone GD2.F4) and anti-human TLR2 Ab (clone T2.5) were obtained from eBioscience (San Diego, CA). The secondary Ab, biotin-conjugated donkey anti-mouse IgG (H+L chain), and a streptavidin-conjugated fluorophore tertiary Ab were obtained from Jackson ImmunoResearch Laboratories (West Grove, PA). The primers for construction of the plasmids in this study are listed in Supplemental Table I. All constructs were verified by complete sequencing of both strands of all recombinant insertions. The CD4–TLR4 construct was a kind gift from Dr. Charles Janeway, Jr (Yale University, New Haven, CT). The coding region of mouse CD4 extracellular domain (ECD) was fused with that of the transmembrane (TM) and intracellular portions of TLR1, TLR2, or TLR10. Both PCR products were cloned together into pCDNA3.1. The promoter region (∼660 bp) of human ENA-78 gene was amplified from human genomic DNA (22). The PCR product was then cloned into the pGL3 basic vector (Promega, Madison, WI). TLR10 chimeric receptors and internal chimeras. TLR1-10, TLR10-1, and TLR10-6 were created by overlap extension PCR (23). TLR10 internal chimera T10 (6–17)/T1 and T10 (6–17)/T6 were generated using the unique TLR1 and TLR6 constructs made previously, in which unique restriction sites were engineered at the end of leucine-rich repeat (LRR)5 (24). The LRR6–17 region of TLR10 was amplified with appropriate enzyme sites at both ends and ligated into the digested products of TLR1 or TLR6. Pure soluble forms of TLR1, TLR2, and TLR10 were produced in large quantities using the hybrid LRR technique developed by Jin et al. (25, 26). In short, a truncated portion of the TLR ectodomain lacking the C-terminal cap was fused to the highly conserved LRR C-terminal capping module of VLRB.61, a hagfish variable lymphocyte receptor. With the aid of the computer software DNAWorks (Bethesda, MD) (27), six adjacent sets of ∼60-bp overlapping oligonucleotides were used to synthesize the sequence encoding aa 133–200 of the hagfish VLRB.61 clone. Using overlap extension PCR, the VLR coding region was fused to the 3′-end of TLR 1, 2, and 10 ECD, encompassing aa 22–476, 17–508, and 20–474, respectively. The PCR products were cloned as a BglII/NheI fragment into a modified pDisplay vector containing an HA-tag upstream of the BglII site and an Fc domain of the human IgG1 downstream of the NheI site (kindly provided by Dr. David M. Kranz, Department of Biochemistry, University of Illinois at Urbana Champaign). A thrombin cleavage site (LVPRGS) was also added at the 3′-end of the TLRvlr hybrid to allow cleavage of the soluble TLR from the Fc fusion protein. A Flag-tagged TLR2vlr-Fc construct was also engineered. Site-directed mutagenesis of the TLR10 mutants was performed in TLR10 chimeric receptor TLR10-1. Oligonucleotides encoding amino acid changes were designed and used to introduce mutations into the TLR10 template through PCR. The retrovirus vector pMX-IRES-GFP (Cell Biolabs, San Diego, CA) was modified by inserting the preprotrypsin signal sequence, followed by a FLAG linker, into BamHI and NotI site to generate pMX-preprotrypsin-FLAG plasmid. The coding sequences of TLR1, TLR10, and TLR10-1 were directly inserted into the modified retrovirus vector to generate pMX-TLR1, pMX-TLR10, and pMX-TLR10-1. The human colonic epithelial cell line SW620 was cultured in RPMI 1640 medium containing 10% (v/v) FBS and 2 mM l-glutamine. 293T cells were cultured in RPMI 1640 medium supplemented with 10% (v/v) FBS and 2 mM l-glutamine. The human TLR10-expressing, stable RAW 264.7 cell lines were obtained by nucleofection (Lonza, Basel, Swizerland) of HA-tagged TLR10 plasmid or an empty vector control into RAW 264.7 cells. After selecting in G418 (0.3 mg/ml) for 3 wk, stable batch cell lines expressing high levels of TLR10 were verified by RT-PCR and flow cytometry using anti-HA Ab. Cells were cultured at 37°C in a humidified environment containing 5% CO2. Stable HEK 293F cell lines expressing recombinant soluble forms of each TLR–ECD–Fc fusion protein were generated by transfection of the rTLR plasmids using the cationic lipid transfection reagent 293fectin (Invitrogen Life Technologies). Cells were then cultured under G418 selection (0.25 mg/ml) for 3–4 wk, and individual stable clones expressing high levels of rTLR protein were isolated using limiting dilution cloning and selected by Western blotting. Clones were cultured at 37°C, 8% CO2 in serum-free Freestyle 293F expression medium (Invitrogen Life Technologies). SW620 cells or 293T cells were cotransfected with various TLR combinations along with an experimental promoter-driven firefly luciferase reporter and a Renilla luciferase transfection control reporter. Transfection was mediated by using Fugene6 (Roche Applied Science, Indianapolis, IN) at a lipid/DNA ratio of 4:1. Two days after transfection, cells were stimulated with indicated agonists for ≥6 h, and cell lysates were collected. Luciferase enzyme activities were measured using the Dual-Luciferase reporter assay system (Promega). The values of firefly luciferase were first divided by the Renilla luciferase values to normalize the transfection efficiency among different wells. TLR1-deficient mice were a kind gift of Dr. Shizou Akira (Osaka University, Osaka, Japan). Murine embryonic fibroblasts (MEFs) were prepared from 13.5-d-old embryos and cultured in DMEM supplemented with 10% FBS. Cells at passage 3, 4, or 5 were used for the experiments. For retrovirus infection, the 293T Ampho packaging cell line was transfected with retroviral vectors using Fugene 6 reagent (Roche Applied Science). The viral supernatant was harvested 48 h posttransfection and used to infect MEF cells by incubating with MEF cells under 10 μg/ml polybrene (Sigma-Aldrich) for 24 h. After culturing cells in fresh DMEM for another 24 h, the infected MEFs were collected and plated in 96-well plates at a density of 1 × 104 cells per well and cultured for 12 h. For stimulation, cells were treated with increasing concentrations of Pam3CSK4 for 24 h. The concentration of mouse IL-6 in the culture supernatant was measured by ELISA using paired Abs (Invitrogen). Stable cell lines of RAW 264.7 cells expressing HA-tagged TLR10 were grown on chambered microscope slides (Lab-Tek, Nalge Nunc, Rochester, NY) and incubated with 2 × 106 zymosan particles/ml for 10 min. Cells were fixed in 4% paraformaldehyde for 20 min and permeabilized in acetone for 5 min at −20°C. Nonspecific sites were then blocked by incubating for 30 min at 4°C in blocking buffer (PBS/10% rabbit serum/0.03% NaN3). HA-tagged TLR10 was detected by using mouse anti-HA mAb (Sigma-Aldrich), biotin-conjugated donkey anti-mouse IgG (Jackson ImmunoResearch Laboratories), and streptavidin-conjugated Alexa 555 (Molecular Probes, Eugene, OR). Cells were then costained for mouse TLR2 using a directly conjugated TLR2.5-Alexa 488 Ab (eBioscience). All images were obtained with 40× objective and oil immersion using a Zeiss LSM510 (Carl Zeiss, Thornwood, NY) confocal microscope at the School of Molecular and Cellular Biology Imaging Facility (University of Illinois, Urbana, IL). Vector control cell lines did not exhibit staining for the HA tag. HEK 293T cells were transfected in 10-cm tissue culture dishes with specific TLRs along with MyD88 (0.75 μg HA-tagged TLR2, 2.25 μg FLAG-tagged TLR1 or TLR10, and 1 μg FLAG-tagged MyD88). Twenty-four hours posttransfection, half of the dishes were treated with Pam3CSK4 (200 ng/ml) for 10 min, and all cells were lysed using radioimmunoprecipitation assay buffer. Cell extracts were incubated with anti-HA affinity gel for 1 h at 4°C, followed by extensive washes of the beads with lysis buffer. Samples were separated on 7.5% PAGE and transferred to Hybond-P membrane (GE Healthcare, Piscataway, NJ). Western blotting was performed using HRP-conjugated anti-FLAG Ab (M2) or HRP-conjugated anti-HA Ab. 293F cell lines stably expressing TLR–ECD–Fc fusion proteins were seeded at 0.3 × 106 cells/ml in serum-free medium and incubated with shaking for 5 d. Recombinant protein G Sepharose beads (GE Healthcare; 1 ml 50% slurry) were added to 1 l filtered culture supernatants and stirred at 4°C overnight. Protein G beads were recovered by centrifugation at 3000 × g for 15 min at 4°C and were subsequently packed in a glass column connected to the AKTA prime purification system (GE Healthcare). The beads were washed with 30 ml binding buffer (20 mM sodium phosphate buffer [pH 7]) at a flow rate of 1.0 ml/min, and the fusion protein was eluted with 0.1 M glycine-chloride (pH 2.3) in 1.0-ml fractions on tubes containing 100 μl neutralizing buffer Tris-HCl (pH 9). The eluted protein was dialyzed overnight against PBS (pH 7.4) at 4°C. Proteins were concentrated using an Amicon Ultra centrifugal filter device with 10,000 nominal m.w. limit (Millipore, Bedford, MA). The protein concentration was measured using bicinchoninic acid assay. The TLRvlr–Fc fusion protein was then incubated with thrombin (Novagen, Gibbstown, NJ) at 25°C for 16–18 h to facilitate the removal of the Fc tag, at an optimized concentration of 1 U thrombin per 0.25 mg fusion protein. After thrombin cleavage, protein G beads were added to the protein samples to remove Fc fragments, as well as uncut Fc-tagged TLRvlr in solution. After 2 h incubation at 4°C, the slurry was passed through a spin filter (Novagen) to separate the beads containing Fc fragments and uncut proteins from the TLRvlr proteins. The purity of the hybrid proteins was determined by mass spectrometry (Mass Spectrometry Laboratory, School of Chemical Sciences, University of Illinois at Urbana Champaign) using MALDI as the ionization technique and sinapinic acid as a calibration matrix. Final protein concentration after thrombin cleavage was measured using the bicinchoninic acid assay. HA-tagged TLR1vlr and TLR10vlr hybrid proteins (10 μg/ml in PBS [pH 7.4]) were coated in microtiter wells overnight at 4°C. For all ELISAs, binding steps were performed at room temperature in MES buffer (pH 7.5), and wells were washed with PBS containing 0.05% Tween-20. After blocking with a commercially available blocking buffer (Pierce, Rockford, IL) for 2 h, wells were washed and incubated with an equimolar amount of Flag-tagged TLR2vlr that had been preincubated for 2 h at 25°C with various concentrations of the synthetic ligands Pam3CSK4, MALP-2, and Ac2CSK4 in MES buffer (pH 7.5). One set of preincubation reactions contained 20 μg/ml blocking anti-TLR2 Ab (T2.5). After washing, wells were incubated with HRP-conjugated anti-Flag (M2) mAb (Sigma-Aldrich). Detection was performed by the addition of an o-phenylenediamine tablet (Sigma-Aldrich) dissolved in 0.05 M phosphate-citrate buffer (pH 5) containing 0.05% H2O2. The colorimetric signal was stopped with 4 N H2SO4, and absorbance was read at 490 nm using an ELISA plate reader. All TLRs are characterized by an N-terminal ECD, composed of LRR motifs, followed by a single spanning TM domain and a C-terminal intracellular TIR signaling domain. To assess the function of TLR10 without knowledge of the ligand, the ECD domain of the receptor was replaced with that of CD4, an approach that was used to generate constitutively active forms of the TLRs (13, 29). Following transfection, a CD4–TLR10 fusion failed to induce reporter gene expression from a variety of promoters, including NF-κB, IL-8, and IFN-β (Fig. 1). In contrast, a CD4–TLR4 positive control activated expression of all of these reporter constructs. Because TLR10 is most highly related to TLRs 1 and 6, we hypothesized that, similar to these receptors, it may be a heterodimeric partner for TLR2. As expected, cotransfection of CD4–TLR1 and CD4–TLR2 induced activation of NF-κB and IL-8–driven luciferase reporters. In contrast, CD4–TLR10 in combination with CD4–TLR2 failed to activate any of the reporters (Fig. 1). Notably, cell-surface expression of all of the CD4–TLR chimeras was confirmed (Supplemental Fig. 1). 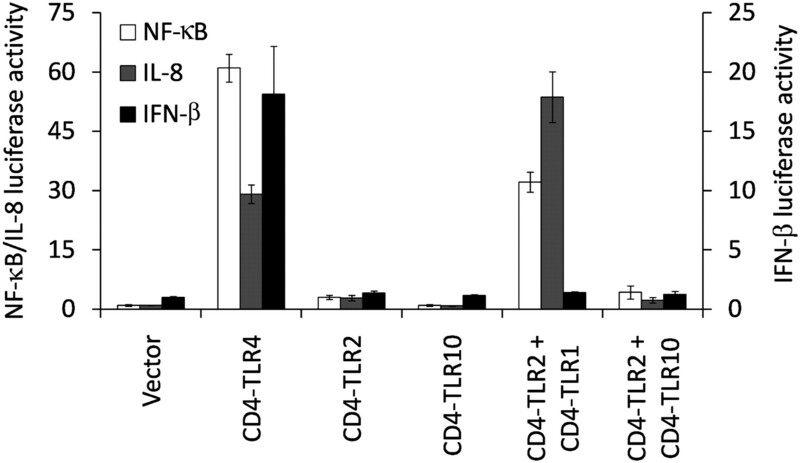 Taken together, these results suggest that CD4–TLR10, either alone or in combination with TLR2, fails to activate reporters commonly associated with TLR signaling. The TLR10 homodimer and TLR2/TLR10 heterodimer do not induce activation of NF-κB, IL-8, and IFN-β promoters. HEK 293 cells were cotransfected with indicated CD4-TLR constructs (400 ng/ml), various luciferase reporters (150 ng/ml), and a Renilla luciferase transfection control (50 ng/ml). Luciferase activities were measured 48 h posttransfection. Values represent the level of constitutive reporter activation over that of vector alone, whose activity was taken as 1. The error bars represent the SD of three independent values. TLR1 and TLR6 enable TLR2 to discriminate between different microbial products, including bacterial lipoproteins (30, 31). For instance, the TLR2/1 dimer mediates responses to the triacylated lipopeptide Pam3CSK4, whereas the TLR2/6 dimer is required for detection of diacylated lipopeptides, such as MALP-2. Functional analyses demonstrated that the receptor ECD is responsible for lipopeptide recognition, and structural studies showed that the Pam3CSK4 ligand is coordinately bound by TLR1 and TLR2 (24, 26, 32). Given the phylogenetic relationship among TLRs 1, 6, and 10, we hypothesized that lipopeptides could also be agonists for the latter receptor. To investigate this hypothesis, chimeric receptors were generated in which the ECD and TM domains of human TLR10 and TLR1 were swapped (Fig. 2A). After confirming the expression of the chimeric receptors on the cell surface (Supplemental Fig. 2), we assessed their ability to mediate cellular responses to lipopeptides using SW620 cells, a human epithelial cell line in which the activities of TLR2 subfamily members can be reconstituted because of the lack of endogenous expression (24). As expected, TLR1 enabled cells coexpressing TLR2 to respond to Pam3CSK4 (Fig. 2B). However, neither TLR10 nor the reciprocal TLR1-10 chimera, comprising the TLR1 ECD and TM domain fused to the TLR10 signaling domain, could reconstitute lipopeptide responses when coexpressed with TLR2 (Fig. 2B). Importantly, TLR10-1, a chimeric receptor in which the ECD and TM domain of TLR1 was replaced with that of TLR10, mediated full responses to Pam3CSK4 in cooperation with TLR2. Taken together, these results demonstrate that TLR10 cooperates with TLR2 in the sensing of triacylated lipopeptides. The lack of response of TLR10/2 to Pam3CSK4 supports the idea that signaling from this receptor complex differs from that of related family members. TLR10 cooperates with TLR2 and senses synthetic lipopeptides. A, Schematic diagrams of wild type or TLR1 and TLR10 chimeric constructs. B, SW620 cells were cotransfected with the chimeric constructs (180 ng/ml) along with TLR2 (20 ng/ml), an IL-8–driven luciferase reporter, and a Renilla luciferase transfection control, as indicated. Two days after transfection, cells were stimulated for 6 h with 20 ng/ml Pam3CSK4, followed by measurement of luciferase activity. Values represent the level of reporter activation over that of vector alone, whose activity was taken as 1. C, MEFs were derived from TLR1 knockout mice and transduced with retroviruses encoding the indicated constructs. The cells were subsequently incubated with increasing concentrations of Pam3CSK4 for 12 h, and IL-6 concentrations in the culture supernatant were measured by ELISA. Error bars represent the SD of three independent values. To fully confirm the role of TLR10 in sensing microbial lipopeptides, reconstitution experiments were performed using MEFs derived from TLR1-deficient animals. The TLR1-deficient MEFs were transduced with retroviral vectors expressing human TLR1, TLR10-1, and wild type TLR10 and then cultured in the presence of varying concentrations of Pam3CSK4 (Fig. 2C). As reported previously, TLR1-deficient cells exhibit very weak responses to Pam3CSK4 (30). As expected, retroviral expression of human TLR1 enabled greater sensitivity and robust responses of MEFs to Pam3CSK4. Importantly, TLR1-deficient MEFs, reconstituted with chimeric TLR10-1 receptor, also exhibited sensitivity and responses to Pam3CSK4 comparable to that of TLR1-transduced cells. These results demonstrate that chimeric TLR10-1 rescues the responses of TLR1-deficient cells to triacylated lipopeptides. Interestingly, the production of IL-6 in TLR1-deficient MEFs transduced with virus expressing wild type TLR10 exhibited slightly enhanced dose-dependent responses to Pam3CSK4 compared with an empty virus, suggesting that the cytoplasmic domain of TLR10 may weakly activate IL-6 production in these cells. To better define the agonist specificity of TLR10, cells coexpressing TLR10-1 and TLR2 were stimulated with synthetic lipopeptide compounds and a variety of natural microbial agonists with differing specificity toward TLR1/2 or TLR2/6. PamCysPamSK4 and PamCSK4 are TLR2/1-specific agonists that are missing one or both lipids of the diacyl glycerol group of Pam3CSK4, respectively (24). In contrast, MALP-2 is a TLR2/6-specific agonist that possesses the diacyl glycerol group but lacks the third acyl chain on the N-terminal cysteine residue. In combination with TLR2, TLR10-1 mediated responses to TLR1-specific, but not TLR6-specific, synthetic lipopeptides (Fig. 3A). Similarly, cellular responses to zymosan, atypical LPS, and heat-killed microbes were mediated by TLR2 in combination with TLR1 or TLR10-1. In contrast, cellular responses to lipoteichoic acid were enabled by TLR2 and TLR6, established receptor pairs for this agonist (Fig. 3B). Taken together, the data indicate that TLR10, coupled with TLR2, is able to detect a variety of microbial components and suggest that TLR10 shares agonist specificity with TLR1 but not with TLR6. A TLR10-6 chimeric receptor yielded identical results to that of TLR10-1, supporting the idea that agonist specificity is dictated by the ECDs of the receptors (data not shown). Coexpression of wild type TLR10 with TLR2 did not reconstitute responses to any of the TLR2 agonists, further suggesting a unique signaling function for this receptor complex. TLR10 shares agonist specificity with TLR1. SW620 cells were cotransfected with indicated combinations of TLRs, an IL-8 promoter-driven luciferase reporter, and Renilla transfection control reporter. Cells were stimulated for 6 h with 1 μg/ml PamCSK4, 20 ng/ml PamCysPamSK4, or 20 ng/ml Malp-2 (A) or 107 particles/ml zymosan, 2 μg/ml lipoteichoic acid from S. aureus (LTA-SA), 20 ng/ml P. gingivalis LPS (P.G. LPS), 200 μg/ml heat-killed S. aureus (HKSA), or 107 particles/ml heat-killed A. laidlawii (HKAL) (B), followed by luciferase activity assays. Values represent the level of reporter activation over that of vector alone, whose activity was taken as 1. Error bars represent the SD of three independent values. TLRs 1, 2, and 6 are recruited to phagosomes where they sense and mediate phagocyte responses to incoming microbial cargo (13, 33). To examine TLR10 trafficking during phagocytosis, HA-tagged human TLR10 was stably expressed in the mouse macrophage cell line RAW264.7. In the absence of the stimulus, TLR10 and TLR2 appear to be dispersed on the plasma membrane (Fig. 4). Upon incubation with zymosan particles, both receptors are highly enriched and colocalize in early phagosomes. These results support the findings that TLR2 and TLR10 cooperate in mediating responses to zymosan and show that both receptors localize to the phagosome during the ingestion of whole microbes. TLR2 and TLR10 colocalize in phagosomes. RAW 264.7 cells stably expressing HA-TLR10 were not treated or were incubated with zymosan particles at 2 × 106/ml for 10 min before fixing. 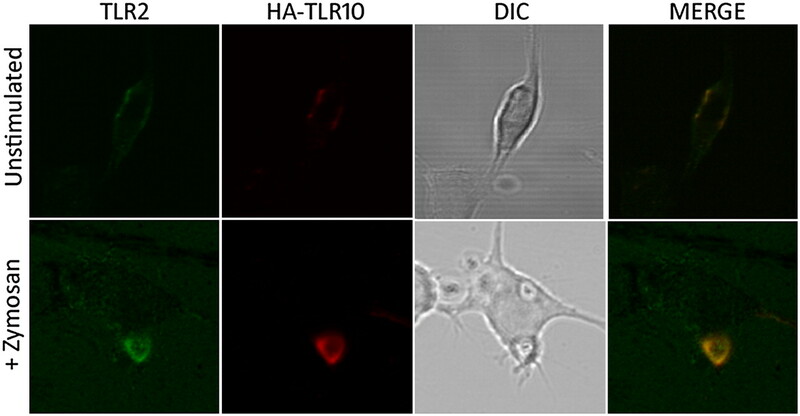 Cells were costained for endogenous TLR2 (Alexa 488) and HA-tagged TLR10 (Alexa 555), followed by confocal fluorescence microscopy. Original magnification ×40. To determine whether TLR2 and TLR10 physically interact, coimmunoprecipitation studies were performed using HEK cells transiently expressing affinity-tagged versions of different TLR pairs. TLR10 was observed to coimmunoprecipitate with TLR2, and this apparent association between the receptors increased with the addition of Pam3CSK4 ligand (Fig. 5). As expected, a similar ligand-enhanced association was observed between TLR2 and TLR1 (34–36). In addition, the recruitment of the proximal signaling adaptor MyD88 to the receptor complexes was assessed in these experiments. The coimmunoprecipitation of MyD88 with TLR2 alone was barely detectable and was enhanced by the coexpression of TLR1 or TLR10 in HEK cells (Fig. 5). The addition of Pam3CSK4 ligand greatly enhanced the apparent recruitment of MyD88 to TLR2/1 or TLR 2/10 heterodimers. These results suggest that, similar to TLR2/1 and TLR2/6 heterodimers, TLR2/10 signaling involves the recruitment of MyD88 to the activated receptor complex. TLR10 interacts with TLR2, and the receptor complex recruits MyD88. HEK 293T cells were cotransfected with indicated TLRs and FLAG-tagged MyD88. One day after transfection, cells were treated or not with Pam3CSK4 at 200 ng/ml for 10 min. 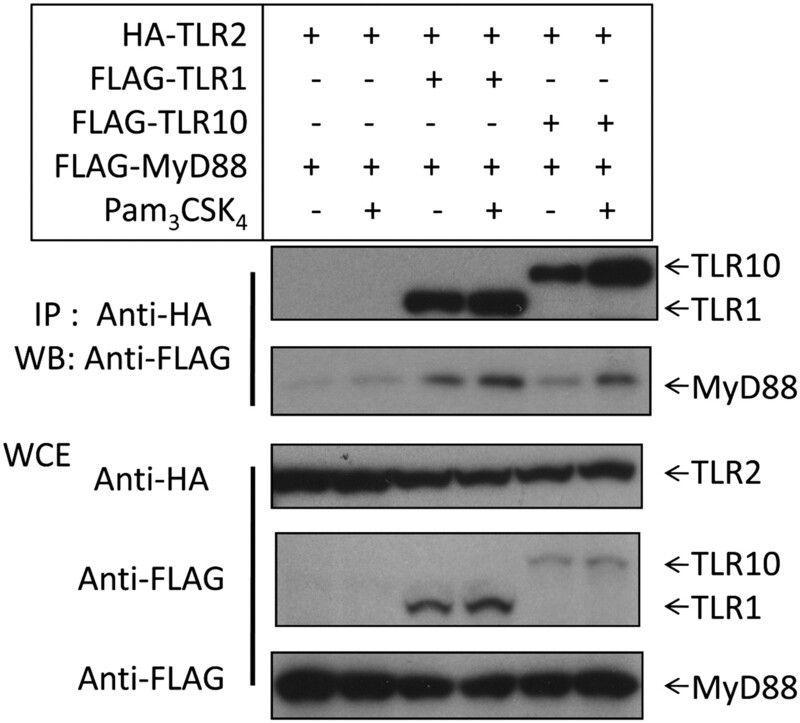 Cell lysates were immunoprecipitated with anti-HA Ab, and samples were analyzed for the presence of TLR10, TLR1, and MyD88 using anti-FLAG Ab. Whole-cell lysates (WCE) were analyzed to verify the expression of transfected TLRs and MyD88. To further investigate ligand-induced physical interactions between TLRs, soluble forms of TLRs 1, 2, and 10 were produced using a hybrid LRR technique in which the ECD of each TLR was fused to a C-terminal LRR motif from hagfish (26). The physical association of purified TLR2 with TLR10 ECDs was studied using microtiter plate assays: TLR10 was immobilized on the plate followed by the addition of TLR2 alone or with various ligands. As shown in Fig. 6A, TLR2 exhibited weak interaction with TLR10, which was greatly enhanced by the addition of Pam3CSK4 in a dose-dependent fashion. Addition of an antagonistic anti-TLR2 Ab T2.5 (37) dose-dependently inhibited ligand-induced complex formation between TLR2 and TLR10. In contrast, the nonstimulatory control compound Ac2CSK4, lacking the acyl- and amide-bound long-chain fatty acids of Pam3CSK4, did not enhance the physical association between TLR2 and TLR10, showing the requirement of lipid chains in the formation of a stable heterodimer. Moreover, incubation with MALP-2, the diacylated lipopeptide agonist for TLR2/6, had no ability to induce a TLR2/10 complex. Collectively, our results demonstrated that the ECDs of TLR2 and TLR10 associate with each other to form a stable complex in a ligand-dependent manner. As expected, identical results were obtained using TLR1 as a control in place of TLR10 (Fig. 6B). Binding of TLR2 to TLR10 or TLR1 is induced by Pam3CSK4. HA-tagged TLR10 ECD (A) or HA-tagged TLR1 ECD (B) was immobilized on microtiter wells, followed by incubation with Flag-tagged TLR2 with increasing concentrations of Pam3CSK4 (with or without T2.5 Ab), MALP-2, or Ac2CSK4, as indicated. The amount of protein binding was detected through an HRP-conjugated anti-Flag Ab. Data are representative of a least three independent replicates. Similar to TLR1 and TLR6, the ECD of TLR10 is composed of 19 sequential LRR motifs. Structurally, LRRs form a solenoid or spring in which each LRR motif consists of a single turn with the leucines, or other appropriately spaced hydrophobic residues, packed within the interior (38, 39). The solved crystal structure of the TLR2/1/lipopeptide complex reveals that the TLR2 and TLR1 solenoids form a heterodimer in which the lipid chains of Pam3CSK4 are coordinately bound (26). Two acyl chains of the diacyl glycerol group are accommodated by a hydrophobic pocket of TLR2, and the third amide-linked lipid chain occupies a hydrophobic channel in TLR1. The heterodimer is further stabilized by additional interactions at the dimer interface (26). Because TLR1 and TLR10 share 43% amino acid identity at the ECDs, identical lipopeptide specificity, and TLR2 as a coreceptor, computational modeling was deemed to be a reasonable approach for gaining insights into the structure of the TLR2/10/lipopeptide complex. The computational model of TLR2/10/lipopeptide exhibits the same overall structure as that of the TLR1-containing complex (Fig. 7A). Similar to TLR1, the model predicts a hydrophobic channel on the convex surface of TLR10 that accommodates the amide-linked lipid chain of the Pam3CSK4 lipopeptide. Modeling of the TLR2/10/Pam3CSK4 complex and functional analyses of receptor chimeras reveal a role for the central LRRs of TLR10 in Pam3CSK4-mediated activation. A, A computational model of TLR10 (yellow) in the complex with TLR2 (blue) and Pam3CSK4 (red), based upon the crystal structure of the TLR2/1/lipopeptide complex. B, SW620 cells were cotransfected with the indicated combinations of TLRs, an IL-8 promoter-driven luciferase reporter, and a Renilla luciferase control. Cells were stimulated with 20 ng/ml Pam3CSK4 or 20 ng/ml Malp-2, followed by measurement of luciferase activity. Values represent the level of reporter activation over that of vector alone, whose activity was taken as 1. Error bars represent the SD of three independent values. Prior to the discovery of the TLR2/1/lipopeptide structure, domain-swapping experiments between TLR1 and TLR6 successfully defined the central LRRs of these receptors as the region required for lipoprotein discrimination (24, 40). Because the ligand-binding and receptor dimerization region are predicted by the model to contain the central LRRs of TLR10, the effects of exchanging LRRs 6–17 of TLR1 and TLR6 with those of TLR10 were examined as a first approach for validating the model and defining the region of the ECD required for lipopeptide recognition. As before, the ability of the chimeric receptors, in collaboration with TLR2, to mediate responses to different lipopeptides was assessed in SW620 cells (Fig. 7B). As observed previously, in conjunction with TLR2, TLR1 and TLR10-1 enabled cellular responses to Pam3CSK4, but not to MALP-2, whose activity was dependent upon TLR6. When LRRs 6–17 of TLR1 were replaced with the corresponding region of TLR10, [T10(6–17)/T1], the receptor retained lipopeptide specificity. 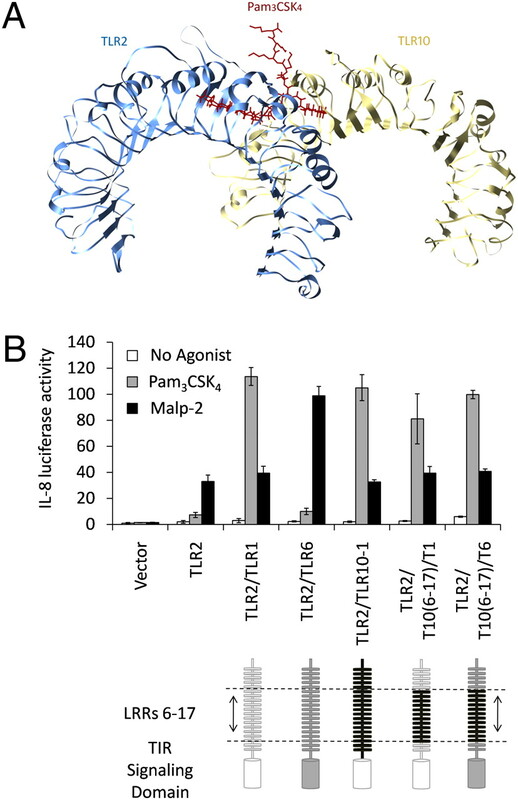 Additionally, when LRRs 6–17 of TLR6 were replaced with those from TLR10, the resulting chimeric receptor [T10(6–17)/T6] exhibited full activity toward Pam3CSK4 but a complete loss of activity toward MALP-2. These results demonstrate that LRRs 6–17 of TLR10 are responsible for defining the lipopeptide specificity of the receptor and support the molecular model of the TLR2/10/lipopeptide complex. The residues that contribute to the formation of the binding pocket are conserved between TLR1 and TLR10 and preserve the overall shape of the lipid-binding channel (Fig. 8A, 8B). Hydrogen bonds between the peptide portion of Pam3CSK4 and TLR1 are also conserved in the TLR10 model (Fig. 8B). To further validate and explore the structural model, site-directed mutagenesis was performed on the residues in the ECD that seem to be crucial for ligand binding and TLR2 dimer formation. All of the receptor mutants were expressed on the cell surface (Supplemental Fig. 3), and their ability to mediate cellular responses to Pam3CSK4 was assessed. To provide a functional readout in the SW620 epithelial cell system, the TLR10 mutants were generated within the TLR10-1 chimeric receptor. Corresponding amino acid residues in TLR1 were also assessed for comparative purposes. The model predicts that similar to TLR1, a loop containing aa 311–316 contributes to the dimer interface and the entrance of the hydrophobic lipid-binding channel (Fig. 8B, 8C). The orientation of the loop is important, especially because the backbone oxygen between aa 313 and 314 forms a hydrogen bond with the lipoprotein (Fig. 8B). Phe314 of TLR1 and Ile314 of TLR10 are buried and make hydrophobic intramolecular contacts that seem to orient the protein backbone of the loop. Substitution with a charged lysine residue at position 314 almost completely abrogated the function of both receptors (Fig. 9). In TLR1 and TLR10, Val311 and Phe312 are positioned at the entrance of the channel; however substitution of either amino acid with a charged residue had little effect on the activity of either receptor to Pam3CSK4. A nearly complete loss of activity was observed following mutation of Gln316, whose side chain in both receptors forms a hydrogen bond with the amide oxygen of the Pam3CSK4 lipid chain. 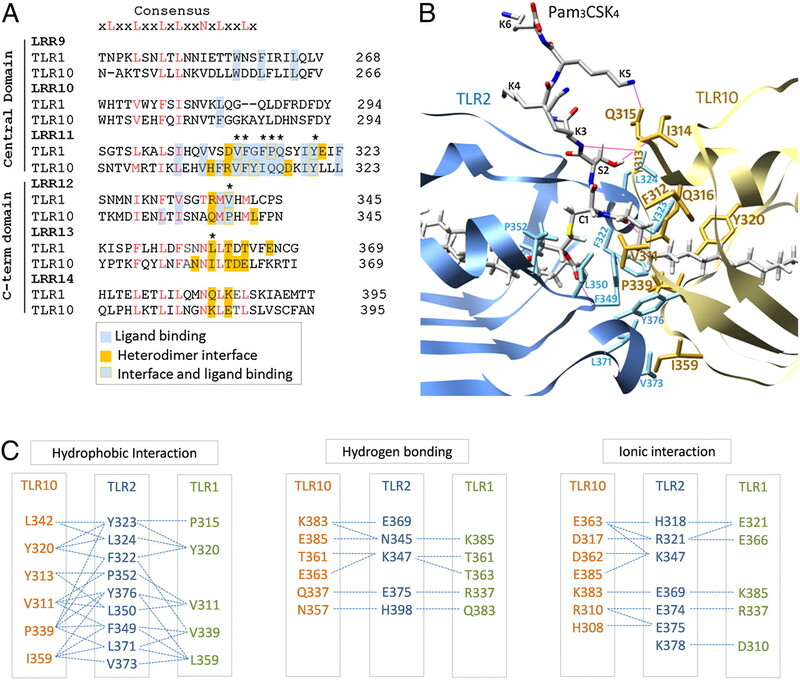 The structural requirements for recognition of PamCysPamSK4 by TLR1 or TLR10 are identical to that of Pam3CSK4, and, as expected, the various TLR1 and TLR10 mutants exhibited indistinguishable responses to these two ligands (Fig. 9). The predicted lipopeptide-binding sites and receptor dimer interface of TLR2/TLR10 complex. A, Sequence alignment of LRRs 9–14 of TLR1 and TLR10. Consensus sequences are shown in red. The mutated sites in TLR1 or TLR10 are labeled with asterisks. B, The modeled lipid-binding channel in TLR10 and the main dimerization interface between TLR10 and TLR2. The side chains of TLR10 residues (gold) that interact with residues in TLR2 (blue) are shown along with carbon (gray), nitrogen (blue), oxygen (red), and sulfur (yellow) atoms of the lipopeptide. Hydrogen bonds are depicted as straight pink lines. Lipopeptide elements are shown in gray (carbon), blue (nitrogen), red (oxygen), and yellow (sulfur). All three-dimensional illustrations were produced with UCSF Chimera (41). C, Residues involved in the receptor dimer interface in the TLR2/10/lipopeptide model or the TLR2/1/lipopeptide structure are shown, and interactions are depicted by dashed lines (26). Mutation of TLR10 residues essential to TLR2/TLR10/lipopeptide complex formation affects receptor function. SW620 cells were cotransfected with TLR2, various TLR10 mutants (A), or various TLR1 mutants (B), as indicated, along with an IL-8 promoter-driven luciferase reporter and Renilla luciferase control. Cells were stimulated with 20 ng/ml Pam3CSK4 or 20 ng/ml PamCysPamSK4 for 6 h, followed by luciferase activity assays. Results are presented as the percentage of the wild type receptor response; error bars represent the SD of three independent values. TLR1 and TLR10 possess an extensive TLR2-binding interface consisting of a hydrophobic core surrounded by hydrogen-bonding and ionic-interaction networks (26) (Fig. 8C). In both receptor complexes, the hydrophobic core overlaps with the entrance of the lipid-binding channel; however, the surrounding polar and charged residues that make H-bonds and ionic interactions with TLR2 are less conserved between TLR1 and TLR10 (Fig. 8C). Hydrophobic interactions with TLR2 contributed by Pro315, Tyr320, Val339, and Leu359 of TLR1 are contributed by Leu342, Tyr320, Pro339, and Ile359 of TLR10, respectively (Fig. 8C). Substitution of Tyr320, Pro339, or Ile359 with polar or changed amino acids dramatically reduced TLR10 activity toward Pam3CSK4 (Fig. 9A). Similarly, a Val339 mutant of TLR1 also exhibited greatly attenuated activity. In contrast to TLR1, the Tyr320 mutant of TLR10 retained most of the receptor activity; this residue is predicted by the model to make more intimate contact than TLR1 with the hydrophobic face of TLR2. Pro315 resides at the center of the hydrophobic core of TLR1 and interacts with Tyr323 of TLR2 (Fig. 8C). Substitution of Pro315 with leucine, which constitutes a naturally occurring polymorphic variant of TLR1, greatly attenuates receptor activity, as reported previously (42). Conversely, substitution of Glu315 of TLR10 with leucine, which is not predicted by the model to contribute to heterodimer formation, retained more than half of the receptor activity (Fig. 9). In conclusion, the structural model of the TLR2/10/lipopeptide complex is consistent with and supported by the mutational studies. Although strikingly similar in overall structure, the TLR1- and TLR10-containing complexes seem to possess subtle differences at the TLR2 dimer interface. TLRs play a central role in host defense by driving appropriate inflammatory and adaptive responses following infection. The early identification of microbial agonists for the TLRs was greatly facilitated by the systematic generation and phenotypic assessment of knockout mice and provided the first insights into TLR function (3). However, this approach is not feasible for defining the function of TLR10 because multiple gaps and insertions have rendered the receptor a pseudogene in mice, as evidenced by sequences from a number of inbred strains (43). We found that Mus caroli, which emerged ∼4 million years ago and predates the Mus musculus group, also possesses a TLR10 pseudogene characterized by numerous gaps and insertions (data not shown). The absence of TLR10 in mice, coupled with a lack of understanding of TLR10 signaling, has precluded the identification of synthetic or natural agonists and has rendered this receptor the only remaining orphan human TLR. We performed experiments using chimeric receptors to overcome these obstacles based upon phylogenetic evidence that TLR10 is most related to TLR1 and TLR6, both of which independently cooperate with TLR2 in the sensing of a variety of microbial and fungal components. Through this approach, we report that TLR10 shares a number of microbial agonists with TLR1, but not TLR6, and uses TLR2 as a coreceptor. Notably, expression of a chimeric receptor, which replaces the TLR1 ECD with that of TLR10, fully reconstitutes responses of TLR1-deficient macrophages to triacylated lipopeptide. We also observed that TLR10 and TLR2 colocalize in the early phagosome and that the ECDs of the two receptors physically interact in a ligand-dependent manner. A computational model of the TLR2/10/lipopeptide complex and mutagenesis studies reveal similarities, as well as some subtle differences, in the ligand binding and dimer interface in comparison with the TLR2/1/lipopeptide crystal structure. The idea that agonist recognition drives receptor dimer formation is supported by the finding that artificial chimeric receptors, which replace the TLR ECD with CD4 or integrin pairs that form natural dimers, exhibit constitutive activation (13, 29, 44). We found that expression of CD4–TLR10, alone or with CD4–TLR2, was unable to activate NF-κB–, IL-4–, IL-8–, ENA-78–, or IFN-β–driven promoters in HEK293 or SW620 cells (Fig. 1, data not shown). These findings contrast with a report showing that CD4–TLR10 activated NF-κB–, IL-4–, and ENA-78–driven promoters in HEK cells (42). Despite our ability to appropriately activate these promoters using CD4–TLR4 or a combination of CD4–TLR1 and CD4–TLR2, we have been unable to detect TLR10-dependent activation of any of the reporter constructs (Fig. 1). In support of our work, an integrin–TLR10 chimera, alone or with an appropriate integrin–TLR2 partner, does not activate NF-κB, despite the fact that other integrin–TLR combinations are able to do so (44). In addition, we found that TLR1, TLR6, or TLR10-1, but not TLR10, induced NF-κB– or IL-8–driven promoters in response to lipopeptide when coexpressed with TLR2 (Fig. 2). TLR signaling is mediated by an intracellular TIR domain, so named because it shares homology with that of IL-1R (14, 45). The appropriate association of two intracellular receptor TIR domains enables the recruitment of specific TIR domain-containing adaptor molecules that ultimately induce the expression of appropriate immune response genes (14, 45–47). The crystal structure of the solved TIR domains of TLR1, TLR2, and TLR10 exhibit a conserved fold consisting of five parallel β-sheets surrounded by five α-helical segments (48, 49). Multiple studies showed that two exposed segments, designated the BB loop and the DD loop, are critical for dimer formation and adaptor recruitment that drive downstream signaling (48, 50–52). The TLR10 TIR domain crystallizes as a dimer with juxtaposed BB loops (49); however, the idea that this constitutes a physiologically relevant form of the receptor is based upon receptor activity experiments that we cannot reproduce (43). Instead of BB loop interactions, rigid-body protein–protein docking studies between the TIR domains of TLR1 and TLR2 revealed a different orientation that involves an interaction between the BB loop of one monomer and the DD loop of another (52). In this configuration, His646, Asn700, Gly676, and Tyr737, which are perfectly conserved between TLR1 and TLR10, make up the TIR domain dimer interface with TLR2 (53). Despite conservation, there are substantial sequence differences between TIR domains of TLR10 and TLR1. Most notably, TLR1 and TLR6 have identical RNFVPG BB loop sequences, whereas that of TLR10 is composed of SYFDPG and includes a two-amino acid insertion in the preceding α-helix. These and other differences within the TLR10 signaling domain may contribute to a distinct charge distribution in the TLR2/10 surface that confers a unique specificity for adapter binding and downstream signaling (54). We observed that the adaptor MyD88 coimmunoprecipitates with the TLR2/10 heterodimer and that this interaction is enhanced by lipopeptide agonist (Fig. 5). However, TLR2/10 fails to activate signals typically associated with MyD88 activity, including canonical activation of NF-κB, suggesting that recruitment of this adaptor to TLR2/10 is distinct from that of other TLRs, including the closely related TLR2/1 and TLR2/6 heterodimers. The idea that recruitment of MyD88 can differ among TLR2 heterodimers is not without precedence, because an I179N point mutation in this adaptor abolishes MyD88-dependent signaling of all TLR complexes, including TLR2/1, while having no effect on MyD88-dependent TLR2/6 signaling (34). In addition to phylogenetic evidence, the unique expression pattern of TLR10 suggests a functional divergence from TLR1 and TLR6. In comparison with these latter two receptors, TLR10 expression seems to be more restricted, with the RNA message found predominantly in lymphoid tissues, including the spleen, lymph nodes, thymus, and tonsils (15, 54, 55). An analysis of isolated cell types revealed that high levels of TLR10 expression are restricted to the B cell lineage, with weaker expression in plasmacytoid dendritic cells (42, 56, 57). Although TLR expression levels are generally low in naive B cells, they are highly induced upon BCR stimulation (57, 58). A variety of TLR agonists was shown to act directly on B cells to induce Ab production to T-independent Ags (59) and to enhance proliferation, isotype switching, and differentiation in response to T-dependent Ags (60–62). TLR7 and TLR9 agonists are generally the focus of many of these studies, given their potential usefulness as therapeutics (63) and their established role in the autoimmune condition lupus (64). However, TLR2 agonists can also provide stimulatory signals to human B cells (65–67). Memory B cells constitutively express a number of TLRs, including TLR2 and TLR10, and can be induced by TLR agonists to proliferate and differentiate to plasma cells (57, 58). Concordantly, cell lines derived from mature B cell neoplasias express high levels of TLR10, and a variety of TLR ligands, including lipopeptides, enhances the survival of multiple myeloma and chronic lymphocytic leukemia cells (57, 68, 69). In an analogous manner, TLRs were shown to play a direct costimulatory role during T cell activation (70). Human T cells express high levels of TLR2 following T cell engagement, and these cells produce elevated levels of cytokine in response to lipopeptide (71). TLR2 is constitutively expressed in memory T cells, which exhibit enhanced responses to lipopeptides. Taken together with the observations in B cells, the results suggest that TLR10 plays an ancillary role in lymphocyte stimulation, especially where the expansion and controlled maintenance of memory B and T cells are concerned. Further evidence that TLR10 plays a role in the control of adaptive immune responses is the finding that this receptor is expressed by regulatory T cells through transcription factors Foxp3 and NF-AT (72). TLR10 genetic variants have been associated with susceptibility to extrapulmonary tuberculosis and asthma (73, 74), two diseases in which TLR2-mediated adaptive immunity is thought to play a major role. The discovery that TLR10 is orthologous to TLR1 in ligand recognition, but not signaling, calls for a re-evaluation of studies in which lipoproteins or other TLR2/1 agonists were used in the stimulation of human and other nonmurine mammalian systems. In vivo, the competition of TLR1 and TLR10 for ligand and coreceptors, such as TLR2, is likely to have significant functional consequences, given the different expression patterns and signaling outputs of these two receptor complexes. In addition to providing a means to study TLR10 function, the discovery of lipopeptides and other microbial agonists for this receptor has important implications for the future therapeutic targeting of TLR2. We thank the Flow Cytometry Facility as well as the Division of Animal Resources of the University of Illinois for excellent service. This work was supported by the National Institutes of Health, National Institute of Allergy and Infectious Diseases Grant AI052344 (to R.I.T.). 1997. Seeking wisdom in innate immunity. Nature 388: 323–324.
. 1997. Innate immunity: impact on the adaptive immune response. Curr. Opin. Immunol. 9: 4–9.
. 2006. Pathogen recognition and innate immunity. Cell 124: 783–801.
. 2006. Mammalian toll-like receptors: from endogenous ligands to tissue regeneration. Cell. Mol. Life Sci. 63: 2901–2907.
. 2000. Bacterial lipopolysaccharide activates NF-kappaB through toll-like receptor 4 (TLR-4) in cultured human dermal endothelial cells. Differential expression of TLR-4 and TLR-2 in endothelial cells. J. Biol. Chem. 275: 11058–11063.
. 2001. Subsets of human dendritic cell precursors express different toll-like receptors and respond to different microbial antigens. J. Exp. Med. 194: 863–869.
. 2002. Control of adaptive immune responses by Toll-like receptors. Curr. Opin. Immunol. 14: 380–383.
. 2007. Toll-like receptors 7, 8, and 9: linking innate immunity to autoimmunity. Immunol. Rev. 220: 251–269.
. 2007. Toll-like receptors and Type I interferons. J. Biol. Chem. 282: 15319–15323.
. 2001. Identification of hTLR10: a novel human Toll-like receptor preferentially expressed in immune cells. Biochim. Biophys. Acta 1518: 157–161.
. 2005. The evolution of vertebrate Toll-like receptors. Proc. Natl. Acad. Sci. USA 102: 9577–9582.
. 2007. Evolutionary analysis for functional divergence of the toll-like receptor gene family and altered functional constraints. J. Mol. Evol. 65: 119–123.
. 2008. Evolution of the chicken Toll-like receptor gene family: a story of gene gain and gene loss. BMC Genomics 9: 62.
. 2008. Functional diversification of the toll-like receptor gene family. Immunogenetics 60: 249–256.
. 2008. Natural selection in the TLR-related genes in the course of primate evolution. Immunogenetics 60: 727–735.
. 2008. Balancing selection is the main force shaping the evolution of innate immunity genes. J. Immunol. 181: 1315–1322.
. 1994. Characterization of the gene for human neutrophil-activating peptide 78 (ENA-78). Biochem. Biophys. Res. Commun. 205: 612–617.
. 1990. Gene splicing by overlap extension: tailor-made genes using the polymerase chain reaction. Biotechniques 8: 528–535.
. 2005. Domain exchange between human toll-like receptors 1 and 6 reveals a region required for lipopeptide discrimination. J. Biol. Chem. 280: 36616–36625.
. 2007. Crystal structure of the TLR1-TLR2 heterodimer induced by binding of a tri-acylated lipopeptide. Cell 130: 1071–1082.
. 2002. DNAWorks: an automated method for designing oligonucleotides for PCR-based gene synthesis. Nucleic Acids Res. 30: e43.
. 2009. CHARMM: The biomolecular simulation program. J. Comput. Chem. 30: 1545–1614.
. 1997. A human homologue of the Drosophila Toll protein signals activation of adaptive immunity. Nature 388: 394–397.
. 2002. Cutting edge: role of Toll-like receptor 1 in mediating immune response to microbial lipoproteins. J. Immunol. 169: 10–14.
. 2003. Importance of extra- and intracellular domains of TLR1 and TLR2 in NFkappa B signaling. J. Cell Biol. 162: 1099–1110.
. 1999. The Toll-like receptor 2 is recruited to macrophage phagosomes and discriminates between pathogens. Nature 401: 811–815.
. 2006. Details of Toll-like receptor:adapter interaction revealed by germ-line mutagenesis. Proc. Natl. Acad. Sci. USA 103: 10961–10966.
. 2003. Mycobacterial lipoarabinomannan mediates physical interactions between TLR1 and TLR2 to induce signaling. J. Endotoxin Res. 9: 264–268.
. 2007. Cutting edge: A common polymorphism impairs cell surface trafficking and functional responses of TLR1 but protects against leprosy. J. Immunol. 178: 7520–7524.
. 2004. Antagonistic antibody prevents toll-like receptor 2-driven lethal shock-like syndromes. J. Clin. Invest. 113: 1473–1481.
. 2008. Structures of the toll-like receptor family and its ligand complexes. Immunity 29: 182–191.
. 2008. The leucine-rich repeat structure. Cell. Mol. Life Sci. 65: 2307–2333.
. 2004. Human but not murine toll-like receptor 2 discriminates between tri-palmitoylated and tri-lauroylated peptides. J. Biol. Chem. 279: 48004–48012.
. 2004. UCSF Chimera—a visualization system for exploratory research and analysis. J. Comput. Chem. 25: 1605–1612.
. 2007. The polymorphism P315L of human toll-like receptor 1 impairs innate immune sensing of microbial cell wall components. J. Immunol. 178: 6387–6394.
. 2005. Human TLR10 is a functional receptor, expressed by B cells and plasmacytoid dendritic cells, which activates gene transcription through MyD88. J. Immunol. 174: 2942–2950.
. 2002. Integrin-nucleated Toll-like receptor (TLR) dimerization reveals subcellular targeting of TLRs and distinct mechanisms of TLR4 activation and signaling. FEBS Lett. 532: 171–176.
. 2007. The Troll in Toll: Mal and Tram as bridges for TLR2 and TLR4 signaling. J. Leukoc. Biol. 82: 196–203.
. 2007. Signaling to NF-kappaB by Toll-like receptors. Trends Mol. Med. 13: 460–469.
. 2000. Structural basis for signal transduction by the Toll/interleukin-1 receptor domains. Nature 408: 111–115.
. 2008. The crystal structure of the human toll-like receptor 10 cytoplasmic domain reveals a putative signaling dimer. J. Biol. Chem. 283: 11861–11865.
. 1998. Defective LPS signaling in C3H/HeJ and C57BL/10ScCr mice: mutations in Tlr4 gene. Science 282: 2085–2088.
. 2005. Differential involvement of BB loops of toll-IL-1 resistance (TIR) domain-containing adapter proteins in TLR4- versus TLR2-mediated signal transduction. J. Immunol. 175: 494–500.
. 2006. Structural and functional evidence for the role of the TLR2 DD loop in TLR1/TLR2 heterodimerization and signaling. J. Biol. Chem. 281: 30132–30142.
. 2003. Structural complementarity of Toll/interleukin-1 receptor domains in Toll-like receptors and the adaptors Mal and MyD88. J. Biol. Chem. 278: 41443–41451.
. 2006. Porcine Toll-like receptor 1, 6, and 10 genes: complete sequencing of genomic region and expression analysis. Mol. Immunol. 43: 1474–1480.
. 2006. Genomic organization and transcript profiling of the bovine toll-like receptor gene cluster TLR6-TLR1-TLR10. Gene 384: 45–50.
. 2002. Quantitative expression of toll-like receptor 1-10 mRNA in cellular subsets of human peripheral blood mononuclear cells and sensitivity to CpG oligodeoxynucleotides. J. Immunol. 168: 4531–4537.
. 2003. The toll-like receptor repertoire of human B lymphocytes: inducible and selective expression of TLR9 and TLR10 in normal and transformed cells. Blood 102: 956–963.
. 2003. A role for Toll-like receptors in acquired immunity: up-regulation of TLR9 by BCR triggering in naive B cells and constitutive expression in memory B cells. Blood 101: 4500–4504.
. 2008. Macrophages pulsed with Streptococcus pneumoniae elicit a T cell-dependent antibody response upon transfer into naive mice. J. Immunol. 181: 1787–1797.
. 2005. Control of B-cell responses by Toll-like receptors. Nature 438: 364–368.
. 2007. B cell intrinsic TLR signals amplify but are not required for humoral immunity. J. Exp. Med. 204: 3095–3101.
. 2006. Toll-like receptor stimulation as a third signal required for activation of human naive B cells. Eur. J. Immunol. 36: 810–816.
. 2007. Therapeutic targeting of innate immunity with Toll-like receptor agonists and antagonists. Nat. Med. 13: 552–559. 2006. Toll-like receptors in systemic autoimmune disease. Nat. Rev. Immunol. 6: 823–835.
. 2008. Toll-like receptors: lessons to learn from normal and malignant human B cells. Blood 112: 2205–2213.
. 2006. A distinct Toll-like receptor repertoire in human tonsillar B cells, directly activated by PamCSK, R-837 and CpG-2006 stimulation. Immunology 118: 539–548.
. 2006. Toll-like receptor 2-mediated human B cell differentiation. Clin. Immunol. 120: 272–284.
. 2006. Toll-like receptors mediate proliferation and survival of multiple myeloma cells. Leukemia 20: 1138–1144.
. 2009. Expression and function of toll like receptors in chronic lymphocytic leukaemia cells. Br. J. Haematol. 144: 507–516.
. 2007. Toll-like receptors: paving the path to T cell-driven autoimmunity? Curr. Opin. Immunol. 19: 611–614.
. 2004. TLR2 is expressed on activated T cells as a costimulatory receptor. Proc. Natl. Acad. Sci. USA 101: 3029–3034.
. 2007. FOXP3 regulates TLR10 expression in human T regulatory cells. J. Immunol. 179: 1893–1900.
. 2007. Full-exon resequencing reveals toll-like receptor variants contribute to human susceptibility to tuberculosis disease. PLoS One 2: e1318.
. 2004. TOLL-like receptor 10 genetic variation is associated with asthma in two independent samples. Am. J. Respir. Crit. Care Med. 170: 594–600.